He started out as just a scrappy kid on Corellia. He didn’t have a credit to a name. He didn’t have a Wookiee as a best friend… yet. He didn’t have the Millennium Falcon yet. He wasn’t a hero of the Rebellion yet. He hadn’t rescued Princess Leia from the siege on Hoth and he certainly hadn’t been trying to smuggle Rathtars across the galaxy. He was just a simple kid with a ton of moxie, kind of like your little one! Yes, your child is probably a lot more like Han Solo than you might realize. He might not be a crack shot pilot just yet, but we’re willing to bet that with a little mentoring and this child Han Solo costume, you’ll be able to transform your little one in the greatest smuggler the galaxy has ever seen! 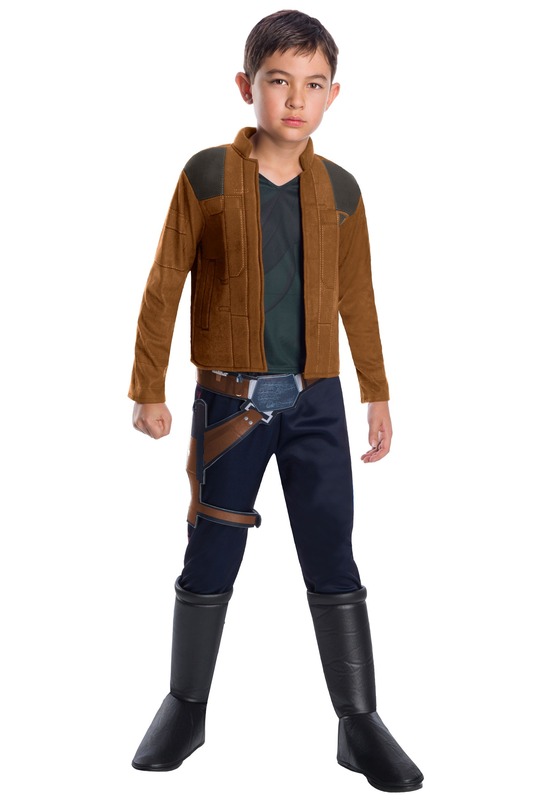 Based on Solo: A Star Wars Story, this Han Solo child costume gives your child the look of the young character from the movie. The top is a brown jacket with an attached top that will have your child ready to execute some daring ship maneuvers. The pants have attached boot tops on them, so your child can wear his own pair of shoes with this outfit. The final piece to the outfit is the belt with attached holster. Just put that around his waist and your child will be ready to shoot first. There’s no telling how far your little one will go in the galaxy with this outfit! And if you’re itching to go on a Star Wars-style adventure alongside your child, then just check out our Chewbacca costumes. Han Solo can’t have an intergalactic adventure without his best pal. Just make sure you equip your little one with one of our many toy blasters to finish off the look!